Dylan Sakaguchi "put it to the lead" near Burns Field, Kauai on a rainy Friday night--yes, FRIDAY THE 13TH--then ducked into a tent and hoped for the best. Sometime in the night, his 13-foot Nitro pole slammed down and his 4/0 Penn started to lose 80-lb test line at an alarming rate. 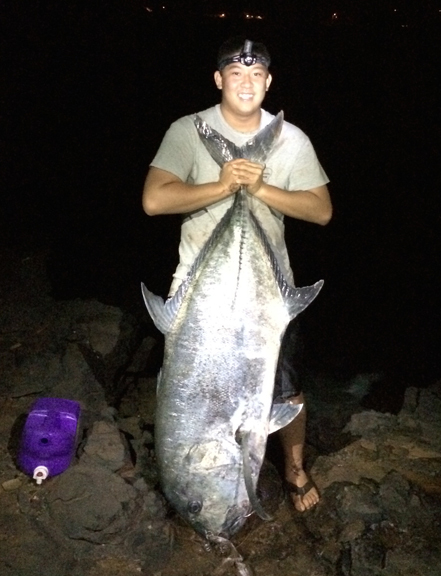 Dylan got on the pole and began the ultimate shorecaster's battle--one against a 100-plus-lb ulua! He eventually landed a 102.8-lb monster and weighed his epic fish the next morning at Tropic Fish Kauai.